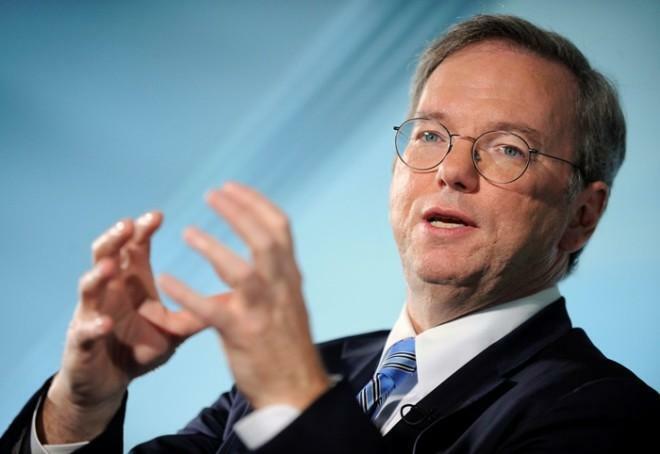 Google Chairman Eric Schmidt took the stage at the All Things D conference earlier this morning and dropped some excellent nuggets for all your Android fans out there. First and foremost is news that Android activation are now hovering around 1.5 million a day. That’s PER DAY. That’s up from the 1.3 million activations reported last September. Not bad El Google, not bad. All totaled, there are now more than 740 million Android phones in use across 320 carriers in 160 countries. Samsung hopes to get Android into as many hands as possible, and believes that a $100 price point is the magic number. As for future Google products coming out of the companies Motorola unit, he promises they have amazing stuff in store. Schmidt wouldn’t say anything about what Motorola would produce outside of smartphones, only to say “Think of it as phones-plus,” Schmidt said “stone-faced.” Hey Eric, how about some T-Mobile love for those products? If Sony can try and make a return to T-Mobile, Motorola is welcome too. Unfortunately Schmidt didn’t offer up any hints about what else Google has in store for the coming months, especially the next generation of Android. I guess we’ll just have to wait another month for Google I/O to see what’s in store for us. Motorola needs to return to T-Mobile for sure. With Google calling the shots now it is probably a good chance they will make phones for T-Mo again. Motorola X should come to T-mo! Only if they return with high end phones. Motorola previous line up of android phones for tmo were all low to mid range crappy devices. agreed. motorola needs to pump something truly amazing out if it wants to be competitive…. or they can go the other route and focus on low-end phones… im just not quite sure which is the right approach. Do we know for sure that the next version of Android is 5.0? Please stop calling KLP “Android 5.0”. There is zero proof it will carry the 5.0 moniker, and if you look very closely at the facts, all signs point to it being 4.3 or 4.5. As such, I’ll eat my hat if KLP is labeled 5.0. Oh, I’m sorry, I seem to have confused this “blog” with a “legitimate news site”, and since “legitimate news sites” are supposed to care about things such as fact checking, and journalistic integrity, I figured he might care. But no, he’s perfectly free to keep spreading mis-information if he so chooses. I didn’t mean to come off as “rude”, and it’s difficult to gauge emotions in a text post. So for that, I apologize, but the point I made, rude or otherwise, still stands. I don’t think anyone confuses me with being a cult celebrity. I do a job and try to bring the news, I make mistakes, I know I do. I don’t pretend to be a “journalist” though and while my “position” as a blogger may have others believe that’s what I am, I’m not a trained journalist. Either way it doesn’t excuse my position of being in a spot where people take what I write as gospel and I understand and respect that burden. I never intended to spread misinformation. That logic doesn’t apply in life at all -_- If you have a point and you feel it in your heart that it’s right, you defend it until you can’t. My intent wasn’t to label Key Lime Pie as Android 5.0 or vice versa, I was merely hoping people understand the reference of Android 5.0 as the “next generation” of Android. Not in the realistic sense, but in the sense that we’ll have to wait and see what’s next…it was a poor choice of wording, but I didn’t consider at the time that I was spreading misinformation. I do care about fact checking and “journalistic” integrity as I make every attempt in every article to write with accuracy. If I misspoke, that’s one thing, but I don’t think it’s fair to label me as not caring if all you had to do was point out the error and ask me to correct it. I could have handled it differently with my words, so thank you for originally pointing it out. I’ll edit the post. Hey David, the comments about “spreading misinformation”, “fact checking” and “journalistic integrity” was actually sarcasm, posted for the benefit of Dion Mac alone. I never meant to imply your site wasn’t any of those things. The first post of mine is actually a “canned response” I’ve been posting on every blog I see, calling out people who refer to KLP as “Android 5.0”, as I’m trying to nip it in the bud (or at the very least, setting up for a “I told you so!” moment when it’s revealed to be otherwise. So please don’t take it personally – I know you better than that, through your writings and stuff. I wouldn’t be here, otherwise. u remind me of a nerdy kid that tries too hard to make a point- a very insignificant, trivial, and an outright who-gives-a-flying-f point. “ZOMG KLP ISN’T 5.0!! U SHOULD BE ASHAMED BLAH BLAH BLAH!!! !” Obviously u didn’t say that, but that’s what your comment sounds like to people lol. Chill out, have some 5.0… I mean key lime pie… I mean, who gives a D what it’ll be labeled lol. When I install a new ROM onto my phone, does that count as an activation? If so, there’s a LOT of owners that are activating 2 or more times a week. This has been brought up over and over, activations are on a per device basis, once you activate your device that’s it. These activation numbers are independent of new ROMs and master resets. Activations are tied to the IMEI ID number, so activations are unique. The funny thing is that the top end is getting so amazing that the mid range androids would have been superphones a year ago. Call me cynical but those numbers don’t seem grounded in reality. I realize that it’s a sales presentation and all but taking all the vendors sales into account, 720 million seems likely the TOTAL number sold – and *android only* sales. Title is quite misleading. I jumped on the article hoping that there was some Nexus information. Instead in reality you refer to ‘Google phone’ as the Motorola phone. Up until a Moto device is a Nexus, it’s not really a ‘Google phone’, even though they are part of the parent company. In the end, looking forward to next month for news of OS and hardware that’s incoming. I don’t believe it’s misleading, at this point any Motorola device could be labeled as a “Google” device. Typically when I want to reference any article as being Nexus related, “Nexus” is in the title. That’s true. I’ll keep my eyes peeled for Nexus. Thanks David! So, Windows Phone is dead. WP sells in a quarter what Android sells in a couple of days (activated + unactivated). And, that too with mighty Nokia. Poor Nokia. It can’t still understand how bad WP is.